The Blockparty 2008 invitation is now out. You can pick it up at the Blockparty 2008 page. Summary of the invitation: go here and pre-register for Blockparty and Notacon (one ticket). The rest of this message repeats this more elaborately. I spent some time before last year’s Blockparty (the demo party I co-organize) explaining exactly what “demoparties” are, some historical context, some thoughts on the future, some thoughts on the politics and so on. Everything I said still applies, so here’s a link to those. If you don’t know what I mean when I say “Demoparty”, you sure as heck will after you sift through all of that. A little commentary on invites, however. Demoparties have been going on since the late 1980s, when they were called “Copyparties”. An aspect of them that rose up that was interesting was giving prizes to the best works of art created on the computer, be they music, sound, or demo (graphics/sound extravaganza program). Within a short time, crack screens might announce an upcoming copy party, pirates happily skipping along pirated releases of software, using them as a slow-motion RSS feed of upcoming happenings. This situation, like the demo parties themselves, started growing in unexpected directions, and over time a specific “demo” would be released in advance of a party (months in advance, often) to let you know a party was going to happen. Last year, we did that with a work called, simply Blockparty, released by the demo group Northern Dragons, which is a North American demo group (a rarity). This year, we brought on a group called Trailer Park Demos to do the demo. After months and months of work, (and day-long stretches of time in it, besides), they’ve come out with a real kicker, the Blockparty 2008 invitation. 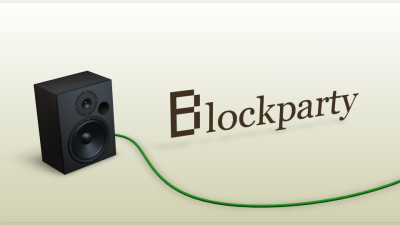 The page on our Blockparty site providing this demo is here. You can download it, as well as the soundtrack for it, and some remixes. A quick mention of that soundtrack. I suggested that it would be a neat idea to have something pretty much no demos tend to have: a hip-hop/freestyle soundtrack, using the talents of one Dual Core, a team who have really been putting together a great show and couple of albums recently. They agreed to it and so there’s a very neat vibe to this invitation, making it in some ways uniquely American. Like the party. This invitation was released at a demoparty in Europe called “The Ultimate Meeting” (or tUM), and it placed in the middle of the pack for the combined demo competition. It was then released on the demoscene ratings board Pouet, and the entry on the site for this demo has garnered very, very favorable reviews. Consider coming to this event, entering the contests, winning the prizes. All the information is here for you. Enjoy the invitation. People broke themselves bringing it to you.